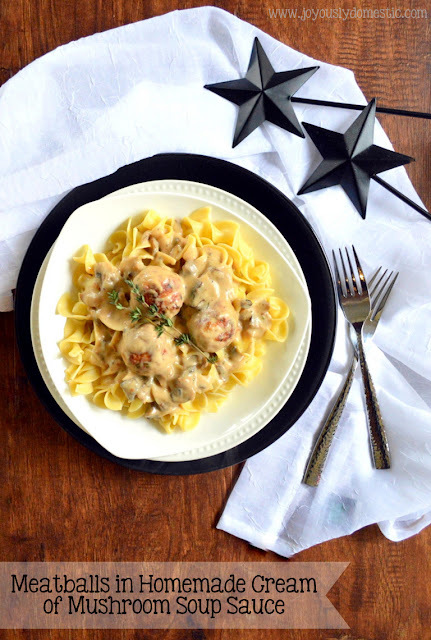 If you're craving tender, savory meatballs simmered in a from-scratch, creamy mushroom gravy, you've come to the right place. My simple recipe shows you how to create a cream of mushroom soup style of sauce that is completely homemade (no canned soup here), yet is easy and uncomplicated. I've, also, included the recipe for my favorite meatballs. Paired together, you've got a dinner dish that I'm sure you'll want to make again and again ... and one that will make your family want to lick their plates clean. This is really a two-for-one recipe post. First, you'll find the meatball recipe with the cream of mushroom soup recipe to follow. The meatballs can be made on their own and used in any recipe ... as can the soup! I am in love with this homemade mushroom soup. It is seriously beyond amazing and way better than the canned stuff. It is ultra-luxurious and has a deep, rich flavor. It can be eaten by itself just as a simple, comforting soup, but it really is a show-stopper matched up with meatballs and served over fluffy egg noodles. Place the ground beef in a large mixing bowl. Whisk the egg and add it to the ground beef. Add in the rest of the ingredients (except olive oil). Wet hands with water, then roll meat mixture into balls (roughly golf ball size) for a total yield of 12 - 14 meatballs. NOTE: At this point, you could lay meatballs out individually onto a baking sheet tray and place tray in freezer if you'd like to make these ahead of time to keep on hand for future use. When they are completely frozen, toss meatballs into a large freezer bag, let the air out, seal, label and freeze until a few hours before using (or thaw in fridge the night before cooking). Once all of the meatballs are browned, remove from pan and set them aside. Now is when you'll start the mushroom soup. Sprinkle the flour over the mushrooms, stir to coat and cook for 3 - 4 minutes. Give the mushrooms a stir every now and then as you're cooking off the raw flour taste. Add broth slowly and stir continuously until all is incorporated. Stir in milk ... start with 1 1/2 cups and add a little at a time of the other 1/2 cup, if needed. Season with salt and pepper. Once the mushroom soup is made, drop meatballs back into the pan, cover and gently simmer over low heat for about 15 minutes. Stir off and on to make sure that the sauce doesn't burn or stick to the bottom of the pan. If at any time the sauce becomes too thick, add in a few splashes of milk and gently stir to combine it into the sauce. Test a meatball for doneness. Serve over cooked egg noodles or prepared mashed potatoes. Garnish with fresh thyme leaves or parsley, if desired. 04/07/16: Update photos and made clarifications within the recipe. This recipe looks so good. I can't wait to try it. My family will love it. My husband loved this recipe; he said "you can make these meatballs & sauce any day of the week"! Love the homemade mushroom sauce. Perfect for just mushroom soup for lunch!!! That sounds great, Donna. Yummy! How do I use this with pre cooked meatballs I bought from my Italian friend? sounded so good, so I made it tonight. Wow! fantastic. this will be a regular..I put it in my "keepers" folder. Oh, and I will NEVER use canned mushroom soup again. Looking forward to your other recipes this week. Bought the wonton wrappers for the lasagna cupcakes. WOW! I am so glad I came across your recipe today. I had some Aidells Caramelized Onion Chicken Meatballs I didn't know what to do with. I made your mushroom soup (which is to die for) I will NEVER and I mean NEVER buy a can of Cream of Mushroom soup again. Added the meatballs which are pre-cooked and served over wide noodles. It was excellent. The only change I made was using Chicken broth. Thank you so much for sharing this recipe. Looks good!! How many servings does it make? I need enough for about 15 ppl. How much should I times the original recipe by? Hope that helps. Thanks for your question and I hope you enjoy the recipe! Delicious...even my 4 very picky kids were asking for seconds! Thank you for a great recipe. I have not tried it in a slow cooker. I wouldn't know where to begin giving you accurate instructions without testing it first.